It’s funny the things you think about in anticipation to change. My little family is amidst a possible move because of job relocation. Ideas seem to whirl about, wonder plays through everything—you watch HGTV and see other places and you wonder where you may land, where you may or may not want to land. You look around at your collection of belongings and know instantly if you could let go of the bed lamps, the tan, suede chair, the hand-carved wooden box you picked up on your trip along the Oregon coast, the colorful butterfly collection that is held in glass, the metal birds gifted to you by someone you love, the books, the vases…the items go on and on, but you seem to know what items play to your hearts desires, the sentiments that are held within each precious piece. Change does have an unexpected opportunity to shed light on the things that truly matter. My husband on more than one occasion has held me close and comforted me saying, “things will be okay, because we have each other.” That simple line of words brings comfort and I know it to be true. I know this whole experience is to help us learn—learn a plethora of necessities..patience in our ability to just allow, to have hope and pray for what is yet to be, to believe in one another, to have faith in something so much bigger, to understand this moment, this day. This change is but a lesson that unfolds each day. Another gift of surprise—something unexpected, something gifted to help us grow and become better for it. 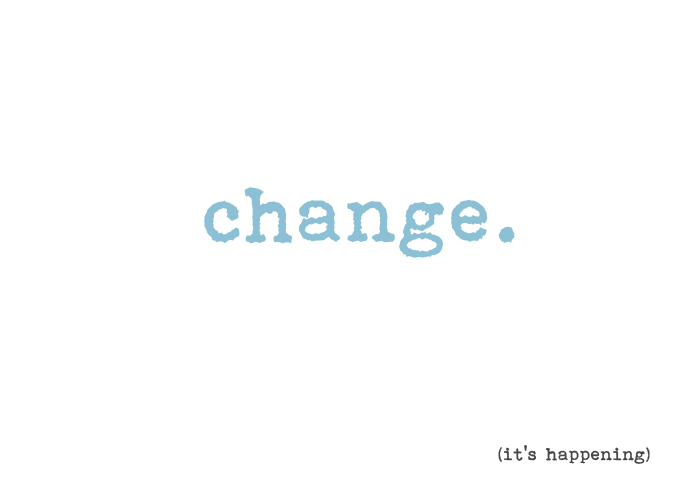 I leave you with a thought of change…What is one thing you would like to change about yourself or your life? What is stopping you? What are you afraid of? What are you holding on to? Change does not have to hold you hostage to your best self. Change is merely a tool for your personal growth. We become stagnet, stuck, listening to our old habits and thought patterns, content to be comfortable, not willing to step out into a greater existence of who we could be. My challenge for you—think of something that scares you, something that will set you on a path to do something for yourself that will ignite your soul, change you just a little, move you in a different direction, make you see things differently. Do something small for you—shake up your life, let go and feel the fear, but know that any small change that moves you is a good thing!! I am seeking to embrace the change!! Join me. Explore: seek out new things, things that may scare you a little. Have you always wanted to rock climb? go try it. Are you terrified of karaoke, grab and friend and begin in the basement. Have you been afraid to get a massage–go get one. Always wanted to learn a language, head to the podcast library and download some learning. Do something that helps you step out of your routine, your comfort. It will help you feel alive, ignited and ready to try something else. Let go & open up new spaces: Begin to de-clutter your surroundings. You can feel what you need to get rid of, what is taking space within your walls and begin to allow openness in to your life. There is a great Zen teaching…Empty your cup…The Japanese master Nan-in gave audience to a professor of philosophy. Serving tea, Nan-in filled his visitor’s cup, and kept pouring. The professor watched the overflow until he could restrain himself no longer: “Stop! The cup is over full, no more will go in.” Nan-in said: “Like this cup, you are full of your own opinions and speculations. How can I show you Zen unless you first empty your cup.” This is a great metaphor for life. How can you have so much clutter, noise, distraction and expect to invite anything new into your life. When you are open and willing to change, you will be ready for something better. Accept and say Yes: Whether it is a job change, a relationship change, a move, a life change, going against or fighting change is not going to help you. This change was gifted to your life and you need to find a way to allow. You need to accept the change and understand this is where you are at this moment in your life. I heard a great metaphor that goes along with this beautifully. Life is like a river, there is a natural flow, a current. You can either lie on your back and enjoy the float and see where the current takes you or you can try to swim against it and have a tough time trying. Change comes and goes, it is what you take from it that will be the true gift for your life. Have patience: This has been the hardest thing for my husband and I. We have a hard time waiting for results, waiting for answers, expecting things from others…patience has been one of our biggest struggles, so we constantly pray for gobs of patience & we smile & laugh our way through it!! I know it has been extremely tough for my husband to not have 50-100 emails each morning, to have his phone not ring, to not feel the amount of responsibility he is used to has been a huge change. I look at him and say—enjoy it while it lasts, because it will all come again & then the real patience will have to step in. This is So the message I keep getting today 🙂 And needing to hear!! Thanks for sharing your thoughts!! Your family is truly an inspiration to me & I just LOVE you guys!! !